The best friend of a teenager who died after taking drugs has called for a law to oblige people to seek help for someone they know is dangerously ill.
Sixteen-year-old Megan Bannister died while in a car driven by the men who had supplied the drugs. Jason Burder, 29, and Adam King, 28, were jailed for supplying MDMA but cleared of her manslaughter. Louis King said he wanted a new law that could see people prosecuted for failing to call an ambulance. "I was angry, I felt that Megan had not had any justice," he added. Louis said Megan's death "counted as an aggravating factor to the drugs charges but I don't think [the sentence] was anywhere near long enough". What happened has prompted him to call for a change in the law. "They should have known something was wrong with her, they did know and they did nothing about it. "It's their fault she is gone, they took away her chance of having any help." Louis said Burder and King "showed none of the kindness she showed to friends, they just treated her like trash". 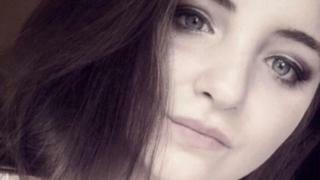 Megan was found lying in the back of a Vauxhall Astra which had crashed near Enderby, Leicestershire, on 14 May. Their trial heard Burder and King had given Megan ecstasy, then filmed her bad reaction. The men, both from Leicester, then drove around buying beer and calling escorts while the teenager was left to die. They were acquitted of manslaughter as it was unclear that their failure to seek medical help had caused Megan's death. Burder was jailed for eight and a half years and King for four and a half years. Louis has started an online petition to try to have the idea debated in Parliament. Megan's sister Kirsten, who is backing the move, said she missed her sister every day. "Megan was caring, kind and beautiful," she added. "We are taking each day as it comes and we are lucky to have a big family and a big support network. "But our lives are ruined, they will never be the same again."